The Diary Of A Roller Derby Rookie: Week 36: NS-Who? Unfortunately, I was struck down with a stomach bug which meant I couldn't attend this week's practice. I didn't want to go a week without a post, so I thought I could use this opportunity to talk about my other role in derby - NSOing. 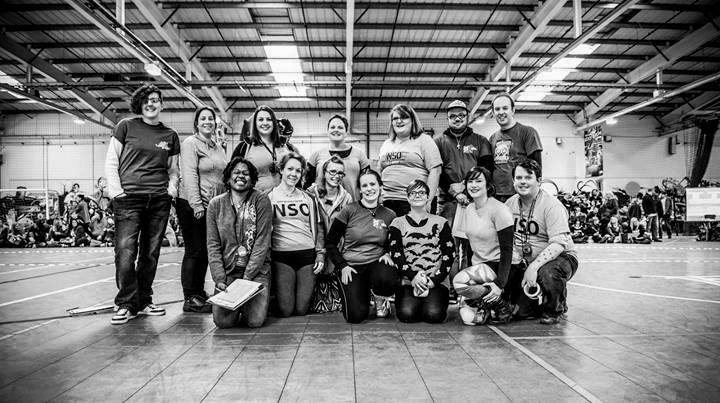 When I first got into derby, I remember representatives of the local roller derby team telling us that if we didn't want to play, we could ref, and if we didn't want to ref, we could NSO. At the time, I was focussed on skating and didn't even pay attention to the people who stand around the centre of the track or who time the penalties. I knew they existed, but I didn't really care who they were or what they did. When I first started skating, we were encouraged to help out with NSOing. We were told it would benefit the league and it would help you to learn the game better. I was eager to help and to learn the game and feeling a little unsure of my skating ability, I thought learning to NSO would be a good back up if it never worked out. So, three weeks in to joining the league I signed up for my first NSO role. After my first role, I was hooked and often signed up to NSO at various closed-door bouts, so much so that I have been skating for 9 months and I have already NSOd at 18 scrimmages, closed-door bouts, and public bouts, and had a crack at 5 different roles. I have met NSOs that have never skated but just love the game, NSOs that have tried skating but decided it wasn't for them, NSOs that skate on teams, NSOs that have retired from skating, and even NSOs that gave up skating so they could NSO more. I know Head NSOs that are so dedicated they stay up until the early hours making sure everything is sorted for upcoming bouts, that paperwork is collected properly and is analysed for statistics, that feedback is given to NSOs, their job never really ends at the final whistle. However, some skaters have never NSOd and I do find that hard to comprehend. So I'm here to list why NSOing is actually awesome! 1. It rapidly improves your understanding of the game. On so many levels. Any role that involves penalties increases your understanding tenfold. With Penalty Tracking, Wrangling and IWB, you now know why that skater has been sent off, what they did wrong, what they could have done to avoid the penalty, and, occasionally, what they could do to rectify it. If you're in the penalty box, you learn there is penalty box etiquette that could even cause another penalty if disobeyed, you learn why sometimes a jammer doesn't sit a full minute, why players sometimes sit two, why the Captain might sit a penalty when they weren't even skating that jam. Line-up trackers can learn different line-up tactics just by seeing how each team lines up, they also learn a little about penalties, they learn what equates to a pass through the pack. Jam timers learn about time-outs, how the game is laid out, they get to see why and when jammers call off jams. Score Trackers get to learn how points are scored, how you can lose lead jammer status, how crucial power jams are. Even laying down the tape and rope for the track helps you learn the proportions of the track, where the point-of-no-return is, what the 10 foot markers actually mean. Even if you're not learning the exact rules of the game, you're learning tactics and how each team varies in how they play the game. You might not get to cheer but you get to appreciate the talent of skaters. You get to see what they skate in, the most common wheel used, how each skater's set-up varies, how they skate. As with above, you get to learn different tactics, see where different skills are used (especially useful if you've learnt them in practice but have never had to opportunity to use them in a game scenario.) You might even get to see skaters you may not have usually seen. For example, I never would have seen Mens Roller Derby if I hadn't had offered to NSO for a merby game (well, unless I bought a ticket!) You might even be fortunate to see some of your skating idols! 3. You get to see the world! Your league might not be able to travel far, yet, or they might just not have any bouts scheduled. In that case, you can offer to help out other leagues all over the world. Personally, I've been as far as Birmingham, but I know people who have been all over Europe and some who have even traveled to the USA! 4. You're helping your league (and Roller Derby as a whole). 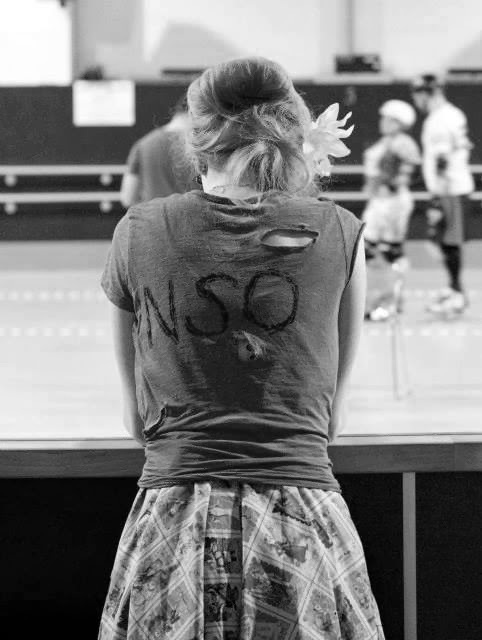 Without NSOs, Roller Derby just wouldn't exist. You need NSOs to keep track of the game, to record the scores, to time penalties. Without that, you're just skating round in circles, hitting each other, to no avail. The refs might be calling the penalties, but no one is going to make sure you're sitting them, they might be counting the score for the pass, but no one is keeping track for the bout. What's even better is that you can also help out other leagues. Some fledgling leagues might not have enough members to NSO, so you can help them out and help their league grow, thus helping spread the word about Roller Derby. 5. You can get involved even if you don't want to skate. For some people, this might be the best part - you don't have to skate! I've known so many people who love Roller Derby but have felt discouraged to join as they don't want to roller skate, they might have injuries they don't want to irritate, they don't fancy the contact aspect. I first decided to NSO as I wanted to be a ref and I felt that NSOing was a good substitute while I was working on my skating skills. It gives you a connection to Roller Derby that being a member in the crowd just doesn't give. You become part of the team. 6. It makes you feel good! Do not expect fame and glory from NSOing. You might be well known amongst the official community and leagues might value your expertise, but the public are unlikely to remember you. NSOs are meant to be invisible. We're meant to help record the game and keep it flowing smoothly without drawing attention to ourselves. Admittedly, I'm not the most inconspicuous NSO, being 5ft9 with bright turquoise hair, but still! 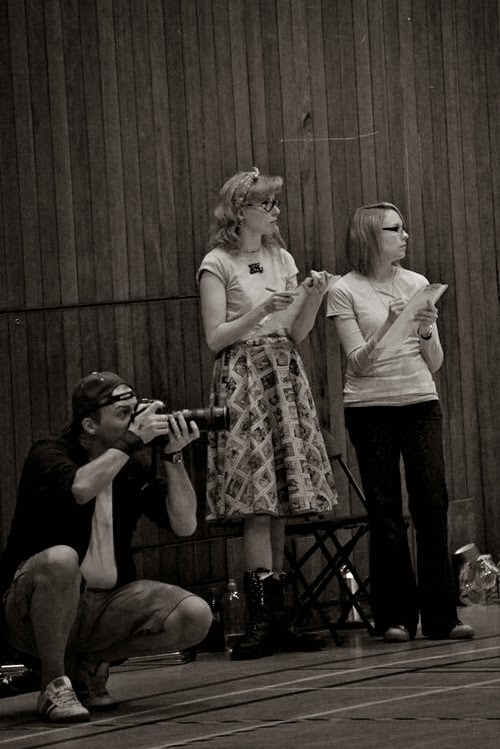 We're essentially the little modest elves of the Roller Derby world. We give our help behind the scenes, without expecting anything in return except the knowledge that we helped the bout become a success. I remember when a skater first came up to me after a bout and thanked me for my help. I was overwhelmed, really. I was just doing it for the love of it yet they fully appreciated it! That made me feel even more awesome! 7. You have another family to be apart of! I knew that my league would be my family, but I never knew that I would have another one with my fellow NSOs. I have the ones within my league and the ones from other leagues. There are some that aren't even connected to a league and work independently. They always seem to travel to the same places as you, they learn what to bring as snacks to feed everyone, they let you know of up and coming bouts and always put in a good word for you. They help you when you're struggling or need advice, and they always congratulate you when you do well. They're all bloody lovely actually and they're a great group of people to know. Seriously. I'm not even kidding. There is always cake for NSOs. I wholeheartedly encourage anyone to give NSOing a go. It will definitely allow you to appreciate the game more; the effort that goes in to putting on a bout and the complexity of the game itself. But, if you do just want to watch or just skate, remember give a little round of applause to the NSOs at the end. Hey Honey, Just wanted to say that I am enjoying reading your blog. I started freshmeat with Dublin Roller Derby last year so it is nice to read about someone else's experience. I also NSO which is a lot of fun, and we all read your blog post about NSOing and agreed with it! Ah, I love NSOing. I'm glad you're enjoying it too! I think it might be the cake. Hehe. Or it brings out the inner geek in me.